Wide screen! I wasn’t expecting that, so it’s a pleasant surprise. The same was true for A Little Snow Fairy Sugar, which made good use of that extra width during close-ups of characters. Contrary to my views of Haibane-Renmei artwork, the animation is lovely. Colors are muted, low on saturation, to good effect. The character designs are decent, and the backgrounds are nicely detailed. You can just feel the work put into those backgrounds as they move by. Scenes flow nicely, such as the transition from night to day. For a first episode, Haibane-Renmei‘s opening is a decent one. 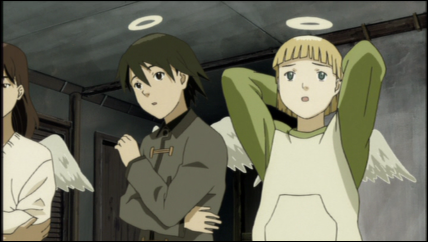 Characters are introduced, and their personalities are previewed, but then most of the cast is reasonably pushed out of the way to let the viewer learn, along with Rakka, about the haibane, and their home. Winged people, born from cocoons, with no memory of their past, and no one in the world who knows them. With man-made halos to guide them, and a strict rule to keep within their own village. The premise is nicely set up, and the first episode is well paced. However, I would have done just fine without the crowning of the wings scene. I know, I know, it’d be kind of hard to leave it out, but I wasn’t expecting it to be quite what it was. I was expecting small wings, something little that would grow over time. Questions are already forming for me. Besides the obvious ones, such as the origin of the haibane, why they sprout wings, why they wear halos, and why they must stay within their town, the age thing sticks out. It was first noted when Kana told Kuu that the cocoon was much larger than Kuu’s was, apparently suggesting the haibane inside might be bigger, older than Kuu. 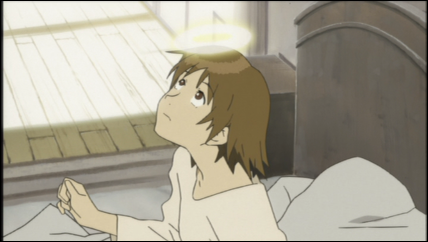 Additionally, there were little kid haibane seen. My two questions here would be 1) why are the haibane “born” at different ages (which is linked to “where do they come from?”) and 2) do the haibane age over time? Having watched the episode in English only so far, I’ve discovered something, but I’m not sure if it’s about my watching habits or about this first episode of Haibane-Renmei. Watching an episode of a series in its native language, I want to then watch it in English to compare the quality. 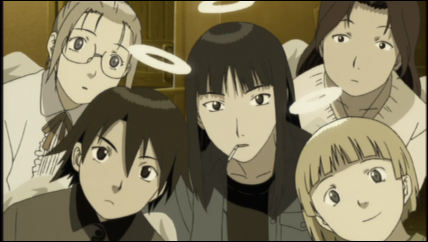 Having watched this first episode of Haibane-Renmei in English only, I don’t feel this same urge to see it in Japanese, to compare voices. Often times, I’ll watch the first episode of a series in its native language, then follow it up with viewing English, and I’m left thinking (when applicable) “Wow, that character’s dub voice is way different from their original.” That in itself isn’t a problem, but when the dub voice doesn’t fit the character’s personality and general attitude, that’s when things feel off. So, chicken or egg. Do I feel a character’s voice is “off” (where applicable) because I heard the original voice first, and the English dub’s voice doesn’t seem to fit? Would I have liked the voice better had I heard it in English first? As things are now, every English voice I heard in Haibane-Renmei‘s first episode was spot on. It fit the character completely. The voices made the characters, spoke their personalities. Reki is the elder sister type, watching out for everyone. Kuu is the excitable child, filled with wonder and joy. Kana is a bit disinterested with things, and probably thinks she knows it all. Hiraki is kind and gentle, proper and helpful. Nemu would be the laid back one. Maybe I’ll be wrong about these personalities as the characters get more screen time, but this is what I get from their English voices. Having their names based on their dreams makes it a lot easier for me to remember them so soon. The cast of English voices is all names I’ve never seen before. Very nice. Listening, I could tell I didn’t recognize a single voice. I’m not sure I recognize any of the Japanese names, either, but I’ll know if I’ve heard them before after watching the episode in Japanese. It’s times like this where it would be really nice if my list of voice actors in series I’ve seen was actually filled out, rather than very incomplete. Overall, the first episode was a decent first episode. If I saw it on television, I’d probably pass over the rest of the series. Since I have all 13 episodes on DVD, however, I’ll be continuing through it, and may very well enjoy the series. Although not a compelling start, it’s a good start. Too bad the DVD encryption is so strong in this DVD. I had my DVD playing software of choice (Xine) freeze playing, leading up to a crash, three times due to being unable to crack some of the encryption. Restarting Xine and trying again would get past the troubled spot, but that lasts only until it finds another encrypted area to trouble it. The VideoLAN client media player seems to deal with the DVD smoothly. Kuu gets extra points for having one of those nice sweaters with the single pocket in the front. Not as many points as she would if it had a hood and pull strings, but I can understand if the hood would bother her wings. It’s next to impossible to answer your questions (1) and (2) without giving major spoilers. I drafted several responses, but to no avail. Maybe I should assume them being literary devices? The canon (including the Life of Haibane booklet) is somewhat muted on (1) and does not answer it clearly. You can build your own theories for fun. I can expand on this later, when you’re about 3 or 4 episodes in. (2) is answered directly down the road. Just watch the show and you’ll see it. When I watched the show, it was at first difficult for me to think of Kana and Kuu as girls (in case of Kuu, even in-show characters were fooled, so in a way HR features a reverse trap… good grief!) Maybe English voice track helps with this. I’ve got it now, thanks a lot for the reminder.